Cut your fuel bills by heating your home with an Air Source Heat Pump. Miller Installations supply and install Air Source Heat Pumps throughout Norfolk, offering a complete service from start to finish. From design through to installation as well as support and advice when your project is finished. 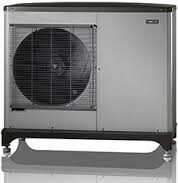 An Air source heat pump takes air from the outside which is absorbed and passed through a heat exchanger. After going thorugh a refrigeration system the heat is then compressed and concentrated which creates temperatures that are useable as hot water and space heating. Basically the heat pump works in the opposite way to a fridge. 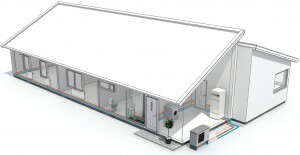 Air source heat pumps work at lower flow temperatures making them an ideal partner for underfloor heating. Air source heat pumps can also be retro fitted straight into an existing heating system but the radiators may need to be replaced and oversized to allow for the lower temperatues. An Air source heat pump can be up to 400% efficient and for every KW of electricity they use to run they can produce upto 4X that in heat energy. Contact us on 01692 218040 or email us at info@millerinstallations.com or pop in to our showroom for free no-obligation advice, to view products or discuss your requirements. Click here for our showroom location. As we are VIP Installers for NIBE, we can offer 7 year warranties instead of the usual 5 years, giving you, the customer, the added peace of mind and reassurance that your product will last. Our VIP status also guarantees that our engineers are properly trained in the products we install. "Miller Installations carried out extensive and complex domestic plumbing and solar thermal work on our property. We have nothing but praise for the excellent quality of their workmanship and unfailing politeness. They are highly recommended for your future projects." Up to 10 year warranties with all of our VIESSMANN boiler installations. German engineered boilers with stainless steel heat exchangers. The WHICH best boilers on the market and our choice of boiler for our customers. Call us for a free home visit and get your boiler installed by a name you can trust. Ground and Air source Installations from one of Norfolks leading heating companies. You know us, we know heating. We are always looking at new products to the market and making sure we keep up with the latest tech and advances in the industry. Interesting couple of days training down with Mitsibushi. They convinced us to take a look at their new units and we are pleased we did. 12KW NIBE air source heat pump installation. Barn conversion Norfolk. Great work as usual from the team. 💪.